Dr Kim uses the innovative Biolase Waterlase in her office. This laser allows her to cut hard and soft tissue with minimal to no bleeding. A graph of the absorption of various wavelengths of laser energy in water shows that erbium laser energy is absorbed at a rate 300% greater than YSSG laser energy. On hard tissue, an erbium laser will quickly vaporize the water naturally present in dentinal tubules and enamel prisms and damage the tooth, without the use a far greater amount of water spray than the YSGG laser. This additional water at the tissue surface means less energy is being absorbed by the hydroxyapatite and enamel, significantly reducing the cutting speed of the erbium laser. On soft tissue, the erbium laser's higher absorption by water means that it draws more blood and fluid to the surface, dehydrating the tissue and obscuring the field of view. The physics of the YSGG wavelength is perfectly balanced to remove enamel and dentin, and to surgically cut and coagulate soft tissue. 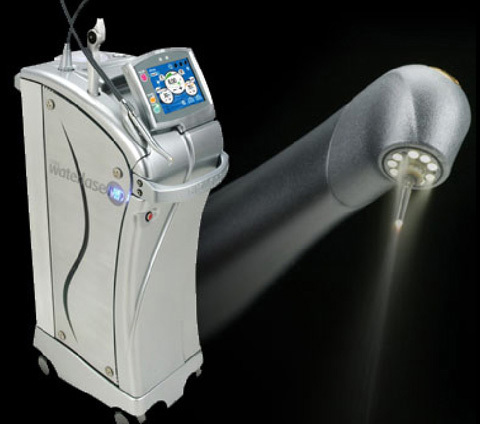 Laser Scaling and Root Planing- Lasers are used to help kill bacteria in deep cleanings. If you have questions or concerns about laser dentistry, please ask Dr. Kim.